Hurricane Odile swept across the Baja California Peninsula in September 2014 leaving behind widespread damage, flooding, and power outages. It reached category 4 intensity before weakening as it tracked across the length of the peninsula. This visualization is a 15-minute Hurricane Weather Research Forecast (HWRF) simulation (1251x1251x61) of Hurricane Odile shortly after it made landfall. The surface represents absolute vorticity (12e-5 s-1) colored by relative humidity. 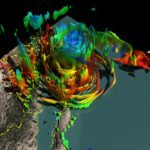 NOAA’s HWRF system is an advanced hurricane prediction system that has the capability to address intensity, structure, and rainfall forecast problems. It is currently used to provide real time numerical guidance in all oceanic basins. The HWRF system is an atmosphere-ocean model configured with a parent grid (~27 km) and two telescopic (~9 and ~3 km) high-resolution, movable 2-way nested grids that follow the storm. There are 61 vertical levels. 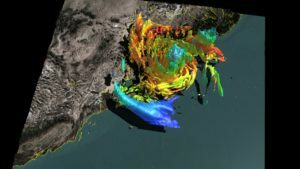 It utilizes a Gridpoint Statistical Interpolation (GSI) Hybrid ensemble-variational data assimilation scheme to assimilate NOAA P3’s tail Doppler radar, dropsonde data, conventional observations, and satellite radiances. 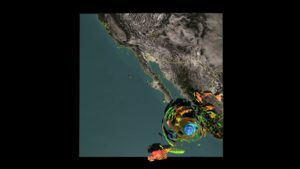 This visualization was enabled by NCAR’s Computational and Information Systems Laboratory (CISL) compute an storage resources, including Yellowstone, Geyser, Caldera and Glade. Funding for this visualization was provided by NCAR’s Research Applications Laboratory (RAL).